I have written about the concept of lock-in before, but it is an idea I keep coming back to. Rather than starting from the assumption that systems and institutions have been designed rationally, we should think about them historically, trying to unearth all the contingent twists and turns that got us to where we are today. Which is to say path dependence is a lot more important than we normally view it. What has come before makes certain next steps easier and more likely than others. Rarely does anyone make a from-scratch, all-factors-considered in rational-long-term-planning decision (especially in democracies where power is dispersed). So people muddle through. One example is fossil fuels. All sorts of things happened along the way that got us to where we are today. But now that we ARE here, and lock-in means that we have designed systems, and have settled expectations, on what energy should and should not be able to do. For example, we built long-distance interstate highways because internal combustion vehicles could travel hundreds of miles before needing to refuel. We spent money on that instead of developing other interstate travel systems. Now we think electric vehicles ought to be able to travel hundreds of miles before recharging... because we have those roads to use, and we always have been able to do. This is insane demand on electric vehicles. They are clearly perfectly fine for intracity use (although prices for electric vehicles are still too high). Renting a gas-powered car for long-haul drives, or finding a different way to do these trips, would allow us to use electric vehicles 95% of the time. But re-setting expectations is hard. As far as I understand economists' answer to this question -- and I admit I do not really understand their answer -- is that high prices will lead people to substitute. In other words, once electric vehicles are cheaper than gas vehicles, people will make the switch (in the basic economic models). But this is too much of an assumption for me to accept; many substitutions are not easy. There are always trade-offs. Nothing does exactly what gasoline does. The basic economic models say that as soon as the prices of electric vehicles come down, their use will skyrocket, but differences from gas vehicles will slow their adoption. And even if it does not slow adoption, lock-in to the existing set of automobile capabilities has slowed the development of electric cars. Everyone has worked hard to emulate the existing capabilities without asking what the from-scratch design might look like. Apparently, the transition from wood to coal was kind of rough. Here is another great example of lock-in: California's water system. Why is it the focus of the high school social studies curriculum is history? And why is writing taught in literature classes? Mostly, the students are expected to write expository papers, so, although the analysis of literature exposes them to different rhetorical techniques, it does not expose the students to garnering evidence and putting together a clear position. Social studies would obviously make a lot more sense. There is little dispute about the historical importance of the report of the Committee of Ten. Appointed by the National Education Association (NEA), the committee, composed mainly of presidents of leading colleges, was charged with establishing curriculum standardization for public-high-school students who intended to go to college. During the previous half century, from roughly 1840 to 1890, the public high school had gradually emerged from the shadow of the private academy. While enrollments were still small by today’s standards (probably less than 5 percent of American teenagers attended public high school in the post-Civil War era), by the 1870s and 1880s the number of public secondary schools was increasing fast enough to occasion some attention. And the Committee of Ten was convened to bring some order to the varied curricula that were growing with them. Under the leadership of Charles Eliot, president of Harvard University, the committee undertook a broad and comprehensive exploration of the role of the high school in American life, concluding, significantly, that all public-high-school students should follow a college preparatory curriculum, regardless of their backgrounds, their intention to stay in school through graduation, or their plans to pursue higher education. From EducationNext. The public high school movement was gaining momentum but their curricula were all different, which made it hard for Harvard and the others to decide whom to admit. Enter a standardized core, suggested by this influential committee: Latin, Greek, English, modern languages, mathematics, sciences, natural history, history, and geography. Of course, it is easier to cut subjects than to add new ones to the list. Latin and Greek were eventually eliminated. Geography is still taught in some middle schools but not at a high school level, and natural history is now mostly subsumed by biology and earth sciences. Nothing new has been added to the list for a century (really, not even computer science makes the required subjects list?). Now to the other question. Why is writing mostly taught in literature class? While I am out of my zone of expertise here, my guess is two-fold. First, because students in those days were expected to read the classics in Latin and Greek, I would guess the English class read far less literature than today (indeed, most English-language literature would have been looked down upon as "popular" and trashy). With less literature to read, their English class would have had a lot more time to focus on grammar, rhetoric, and yes, exposition and argument. I believe the English class then was seen as inheritor of the trivium. Second, I think writing expository papers ended up in English, not social studies, because the history research paper is especially challenging for students. If social studies classes covered a broader range of topics of economics, politics, or ethics, it might be easier to get those students writing basic position papers. I know good history teachers have the students write multiple in-class or homework essays, but these presume a right answer. "Essay" is really a misnomer. The evidence is just facts they already learned from the textbook. Yet staking an original position and doing research on it is intimidating in a history course. Less so when the topic is, "A flat tax is efficient and fair." Anyone with an Internet connection can dig into that topic; it is not intimidating at all. One vision about such a course -- an open-ended inquiry course, broader than just covering a fixed set of facts -- was presented appealing in Neil Postman's Teaching as a Subversive Activity. Or really in any debate-across-the-curriculum book. Consider, as another example of high school curriculum lock-in, the two types of Advanced Placement math exams: A.B. and B.C. Calculus, on the one hand, versus Statistics. More than twice as many students take the Calculus exams than take the Statistics exam, although Statistics is growing more rapidly. The Calculus exam was first given in 1956; the Statistics exam was first given in 1996. When the Calculus exam was first given, it was kind of a rarity that students would get to Calculus in high school. Most students finished with Geometry or perhaps Advanced Algebra with Trigonometry. The sine qua non of a rigorous high school program was students got to Calculus -- less about the student than the school, in a way. Now, it is not really such a rarity anymore. A lot of students do take Calculus, but the Calculus exam has not lost its imprimatur for college admissions. However, there are several compelling reasons for a lot of students to prefer taking a Statistics course to a Calculus course: 1) statistics will be more beneficial in the college studies of students intending to study biology, psychology, or other social sciences than calculus, which is only necessary for math and engineering students; 2) statistics is more important for being a well-informed citizen; and 3) statistics is a mode of thinking that can be applied to a lot of situations. Self-selection is an important concept to understand in many contexts. But the A.P. Statistics exam is seen as an inferior marker of a rigorous high school math preparation and probably always will be. 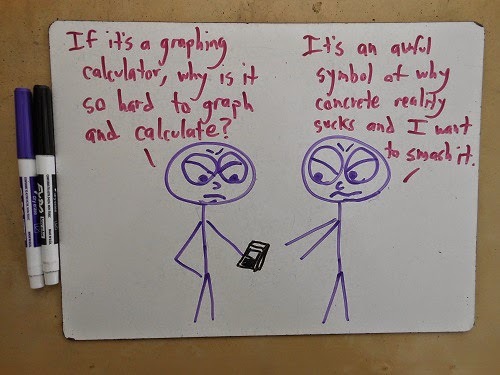 Or, in a more general turn, why not develop a more general exam of basic mathematical knowledge we expect high school students to know, from modeling to manipulating functions to probability to vectors and trigonometry? I think this is what the I.B. exams (S.L. or H.L.) attempt to do. But this may never, in the U.S. at least, replace the Calculus exam. It all comes down to an initial decision, back in the 50s, to write a subject specific exam, rather than a cumulative, general mathematics exam. The latter is less locked-in and can evolve; the former less so. The fact of the Calculus exam implies that mathematics is a sequential, hierarchical ladder and the goal is to get to the top as fast as you can. This is false on both counts. Here is another example, a special pet peeve of mine: the Texas Instruments calculator. The iPod touch: 67 times faster; 11,000 times more ram; 22,000 times more storage. But the iPod costs only slightly more than twice. The TI-84 calculator was on the cutting edge a long time ago, then math textbooks included examples using the calculator, then the A.P. exams decided to allow calculator use. Now we are locked-in on the TI-84 calculator until -- and it will happen soon -- the College Board is ready certify some iOS apps as exam appropriate. This will require a lock-out feature (i.e. an app must have a time lock that prevents leaving the app, so no one can text or use the Internet during the test). You can see debate in the left-hand links. So why is a sports organization also organizing debate? My guess: the N.F.H.S. was founded in 1920. The N.F.L. was founded in 1925. This is also -- again, my guess -- why state championship speech and debate tournaments are separate from N.F.L. (now N.S.D.A.) qualifiers. And why moot court and model U.N. aren't part of the same organization. Perhaps it was some organizational rivalry at the time.